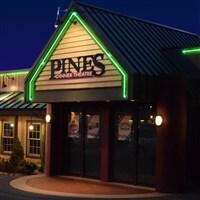 Join Perkiomen at the Pines Dinner Theatre for a memorable Thanksgiving Dinner and Show. Its the most wonderful time of the year to come and celebrate Thanksgiving. Join Perkiomen and enjoy wonderful dining and the spectacular "Walkin' in a Winter Wonderland" in the Lehigh Valley's Pines Dinner Theatre featuring down home hospitality. Join Perkiomen Tours as we visit the Pines Dinner Theatre to celebrate Christmas in grand style. It's the most wonderful time of the year as the Pines celebrates the holiday season. With your favorite songs, holiday traditions, the Nativity, and even Santa Claus, this show will put even the most determined Scrooge in the Christmas spirit! Start a tradition with your family this year, and celebrate the season at A Pines Country Christmas! Fun for the entire family! Our intention is to run each tour as originally planned and published. However, if deemed necessary to do so, Perkiomen Tours reserves the right to make changes to tour components, schedules or itineraries, without prior notification.